When Kilauea stepped up its lava production last year, and suddenly erupted for months and months, it marked many firsts. On one hand, it gave scientists, particularly those at the United States Geological Survey (USGS), a chance to make this the most monitored volcanic eruption in human history, and make some of the most cutting-edge tweaks to their understanding of Kilauea at the same time. It was also the first time drones were officially deployed during an American eruption in this manner, which kept an eye on an eruption that took the top spot as the most destructive in the volcano’s history. It also, however, represented the end of several things too. In December, it became clear that the eruption in the lower East Rift zone was over, as defined by three consecutive months of no activity, per the Smithsonian Institution’s Global Volcanism Program’s metric–but that’s not all there was to it. 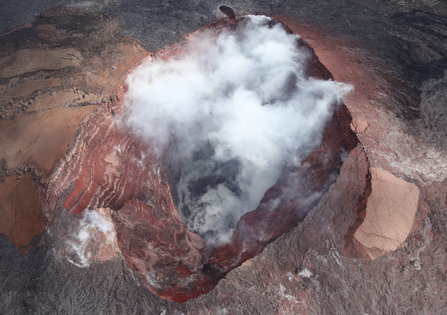 Pu‘u ‘Ō‘ō, a crater in the middle of Kilauea’s east rift zone, had until late-April 2018 been erupting lava pretty much continuously for 35 years. It has been lava-free ever since, and as noted by a new USGS blog post, this could mark the end of an era. Sure, there have been pauses and marked changes in the activity of this particular vent since 1983, lasting from a few hours to a couple of days. On a few occasions, it stopped erupting for one-to-two months, but no more. In any case, it’s safe to say that Kilauea has been continuously erupting since the days of President Reagan’s “Star Wars” missile intercepting initiative, Microsoft Word was first released, Granada was invaded by the US, and David Bowie’s Let’s Dance was released. That prolific outburst put Kilauea on the map as the most continuously active volcano in the world. It provided scientists with plenty of data to gather, and visitors with plenty of spectacle to absorb. As of January, though, we’re into eight consecutive months of precisely zero lava emerging from Pu‘u ‘Ō‘ō. Again, as per the Global Volcanism Program, the end of any eruption can be tentatively declared after three consecutive months of no activity; we’re now approaching three times that time period. The USGS explains that, based on historical data, it’s statistically very unlikely that we’ll ever see lava again at Pu‘u ‘Ō‘ō. It’s pretty amazing to think that although the volcano didn’t quite make it to 36 years of continuous eruptive activity, but everyone can agree that it had one hell of a run. That doesn’t mean that there’s a zero chance that it’ll spew forth lava once more at some undetermined point in the future; volcanoes hardly play by probabilistic rules to the letter, and they can surprise experts. Magma is still present beneath the east rift zone, which will likely erupt again in the future through some vent or another, but it’s very difficult – and unwise – to make any definitive claims in this regard. Either way, you can’t go around saying Kilauea has entered retirement. The USGS stress that their data on the ground movement there shows that magma is not just merely present, but is still in fact being supplied to the east rift zone. That means you can still consider Kilauea to be active. Come to think of it, an “active” volcano probably doesn’t mean what you think it means. Per the USGS’ comprehensive assessment of America’s most hazardous volcanoes, they make it clear that any volcano that has erupted once in the last 12,000 years or so is considered “active.” This isn’t just out of an abundance of caution: volcanoes can sometimes go for centuries or millennia without stirring, only to relatively quickly re-awaken and have a bit of a temper tantrum. The same will apply to Kilauea, whose ranking as America’s most hazardous volcano won’t change as a result of its newfound period of quiescence. As ever, let’s be thankful that some of the best geoscientists in the world are spending their careers keeping a close eye on Hawaii’s volcanic crown.